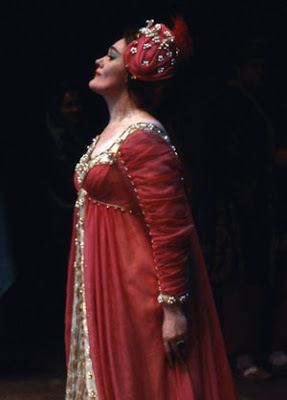 Seattle Opera joins the rest of the world in paying respects to Dame Joan Sutherland--known to her fans as "La Stupenda"--who passed away last night at her home near Geneva. 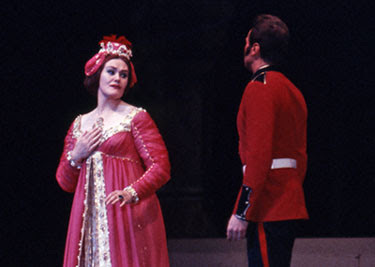 Says General Director Speight Jenkins, "The voice of Joan Sutherland was unique in its combination of size and flexibility. She could have sung any repertory but chose, because of the wise advice of her husband Richard Bonynge, to concentrate on the lyric coloratura, bel canto area. When I first encountered her in staged opera, at her 1961 Dallas Lucia, she astonished me with the magnificence of her sound. My reaction never changed through the next quarter century. Never a great actress, she brought many characters into vivid life through vocal means alone. Her Lucia, Norma, and Gilda especially are unforgettable in their command and power. For sheer excitement the first night of her Elvira in I puritani, with Pavarotti as Arturo, at the Metropolitan ranks at near the top of my sixty-five years of opera going. She also made Amina in La Sonnambula a vocal treasure. She was also a delightful person, both funny and engagingly human. On stage she always seemed larger than life; offstage she was a person of great charm and simplicity." "Standees lined up beginning at 7:30 that morning. At Ms. Sutherland’s first appearance, before she sang a note, there was an enthusiastic ovation. Following the first half of Lucia’s 'Mad Scene' in the final act, which culminated in a glorious high E-flat, the ovation lasted five minutes. When she finished the scene and her crazed, dying Lucia collapsed to the stage floor, the ovation lasted 12 minutes." The following season she appeared as Donna Anna in Don Giovanni, and then in 1970/71 she sang all four heroines in Les contes d'Hoffmann. In the 1977, Sutherland performed her last role with Seattle Opera: Sita in Le roi de Lahore. Feel free to share your thoughts of Sutherland in the comments. Did you ever get to see her perform? In 1967 as a first year teacher in Hoquiam, I drove a carload of students to Seattle for the performance of Joan Sutherland in Lakme'. We were in the very last row of the last balcony. As usual there was fog rolling in to hide the highway on the way home, and one of the students had to roll down the window to follow the white line on the side of the road so that we would not go off the road. It was well after 2:30 AM when I delivered each student to their home. It was all worth it and a treasured memory of a wonderful experience. Sue Elliott here, Education Director for Seattle Opera. Thanks so much for sharing the account of your grand adventure with us. I'm glad that it was a happy ending for everyone on that night in 1967. RIP La Stupenda.